I'm working right now on a IOS/Android Endless Runner called "Retro Retriever" which is near completion with only small pieces missing. One of this small pieces is some animations for the main menu where the Main Character will do special animations when being tapped on. 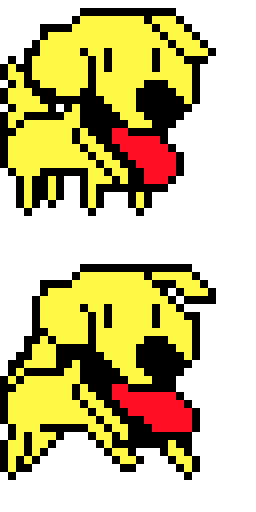 My Main Character is, like you probably guessed, a retro pixel Golden Retriever. Running, falling and those kind of sprites are stuff which my skills are enough for. But the Sprites for the main menu are not reachable with my skill. This is all very basic information and we can still agree on further details when an Artist is found. And like you can see, the style of my character is really retro and simple, so I'm really not expecting much about the art but some decent looking animations. I'm really flexible about Payment so this shouldn't be a Problem. Cute dog sprite ;) PM sent!